Computers; plant machinery; printers and conveyor belts; we find these hard systems in most manufacturing organizations. Soft systems such as master production scheduling software involve people who interface with and operate those resources. Ideally we want these to strike an equitable balance between the two, enabling them to work together in meeting a business’s goals. However, we do not live in an ideal world; both hard and soft systems fail. And yet we must include a third element in the organizational mix: Computers. IT introduced the biggest revolution in industry – and everything generally – since the steam locomotive. For decades now, several businesses offer management packages for S&OP and master production scheduling software and they still have their part to play in today’s IT rich workplace. Dating to the 1980s S&OP keeps a business’s activities on track (Sales & Operations Planning refers to the organizations current business or game plan). The S&OP should explain in a simplified, easy-to-understand way, why functions within a business exist. This type of management ‘short-hand’ greatly aids in keeping activity focused within the business. issues relating to lead-time and delivery ability. The great strength of S&OP, it keeps your business on the shortest path to achieving your objectives, rather than allowing various functions to meander on a less than efficient path. S&OP is not only used for measuring state-of-play regarding a business’s current performance. This powerful tool assesses future market trends. This type of invaluable intelligence ensures that products and services meet customer demands. S&OP provides a broader role in aiding a business to meet its strategic goals. 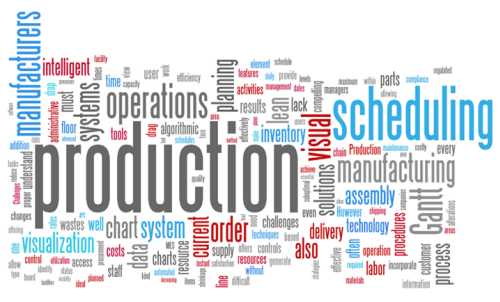 Master Production Scheduling Software (MPS) can be traced back to the 1970s and mostly used in the Manufacturing Industry. As an operational planning tool, management uses MPS for day-to-day business activities. MPS most obviously lends itself to manufacturing environments but the principle of understanding what the loading looks like can apply to any type of company. Many businesses don't appreciate the use of master production scheduling software. They end up overloading their businesses with work. They don't see how their sales and order fulfillment processes function can best work together. They do not achieve their performance levels because they spend so much time running around fire-fighting problems. Key Point: A good Master Production Schedule enables the delivery of products and services on-time and the effective management of resources and materials en-route. Software companies offer both S&OP and MPS packages. Although powerful and costly, in many cases an organization need not buy such sophisticated packages. Spreadsheets and database applications can do the job just as well in many cases. However, for certain new technology revolutionized the workplace. Over time, more and more we placed more faith into computerized systems. With regards to S&OP, forecasting sales, customer demand and running a whole range of "what if" scenarios can be deployed, on a computer screen and at the touch of a button. But if the people who use those systems don’t understand how they work or the full system's potential, the organization suffers. their ability to use their given technological tools. Most workplaces heavily depend on IT but their people use the technology to achieve the given goals. This fact sometimes gets lost in the daily hurly burly of decision making and planning. An organization can have the most glittering IT systems in the world but if its people don’t fully understand how they work, what their roles are in relation to those systems, how to use the technology, then there is a disconnect between people and systems. This results in dysfunctional business processes and poor performance. Key Point: Managers concern themselves about optimal performance. To achieve that however, he/she works with both hard and soft systems, with people and machines. Packages such as MPS and S&OP improves production. product delivery, managing and increasing sales. However, use of these programs needs to be integrated into other functions, particularly Human Resources, with particular reference to staff training and development. Most business managers can wearily testify to he problems of Information Overload. Organizations have all sorts of systems in place to gather information but how much of it really helps? Can that information be turned into knowledge that aids a business process? Powerful management tools like Sales & Operation Planning and Master Production Scheduling software produce phenomenal amounts of information but if not used wisely, then it is less than helpful. Key point: Use relevant information to answer mission critical questions. Like: Are we too busy? Are we too quiet? Do we need extra labor? Are we using the system properly and following the rules? Both Master Production Scheduling software and Sales & Operation Planning software have their place in the modern business world. Many things have changed since their introduction in the 1970s and 80s but a flexible application of both solves problems and aids business performance. Key point: Modern software packages can do some amazing things but if people don't understand or gather the data correctly then people can make bad decisions. Organizations need to be better than ever at delivering high quality products and services at great value and on-time. MPS / S&OP, and even the humble spreadsheet, can help ensure that your business 'machine' works the best way. Each function within an organization provides a purpose, a reason for existing, and there will be some fundamental process / control that can guide it. By understanding these processes, you can make the business machine work even better. Key point: These two fantastic tools MPS & S&OP have been around for many years but we often overlooked them as old and past their sell by date. This however, is a mistaken view. With a little imagination and a little exploration we can apply MPS and S&OP successfully to new circumstances.